All Injury Rehab Chiropractic > Ramon Negrete, D.C. Specializing in chiropractic, Dr. Ramon Negrete delivers comprehensive musculoskeletal health through treating, diagnosing, and managing conditions of the spine, extremities, and soft tissue. Dr. Negrete began his career at Methodist Hospital of Dallas, serving as an emergency medical technician. Inspired by his time helping others, Dr. Negrete attended the Parker College of Chiropractic. 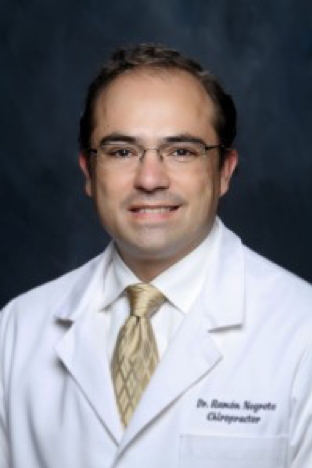 With his degree completed, Dr. Negrete began extensive post-graduate education, attending numerous seminars and certification programs, including Baylor Sports Medicine Rehabilitation Specialist Certification, Radiological Digitalization Certification, and Texas Chiropractic New Doctors Seminar. Certified by the Texas Board of Chiropractic Examiners and National Board of Chiropractic Examiners, Dr. Negrete speaks both English and Spanish fluently.